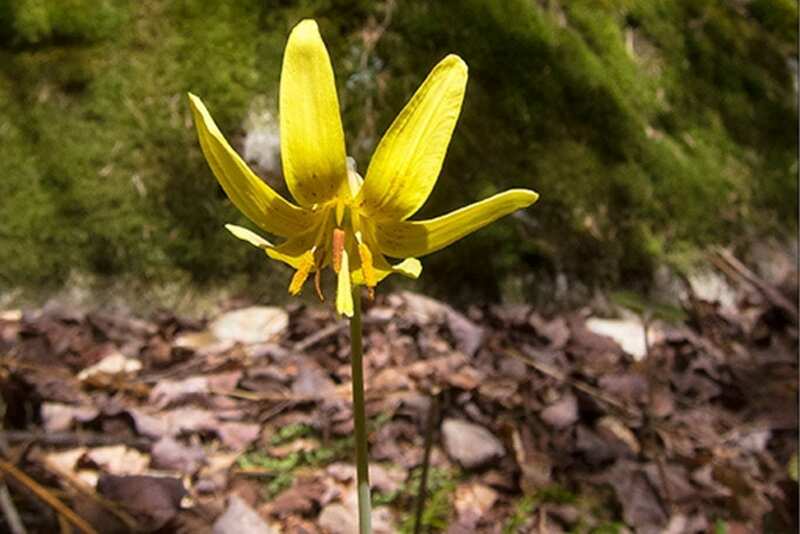 One of the earliest spring flowers in the Adirondack Mountains is the Trout Lily (Erythronium americanum) – a spring ephemeral with delicate yellow blooms and mottled leaves. Like other spring ephemerals, Trout Lilies bloom early in the spring, quickly produce seed, and then wither as the trees around them come into full leaf. This strategy allows the plant to take advantage of the sunlight reaching the forest floor in early spring. The yellow flowers are solitary and nodding, usually about an inch or more in diameter. During bright days, the petals are reflexed. The two 3-8″ inch elliptical leaves are mottled with brown, resembling a trout. Single leaved plants also occur, but do not flower. 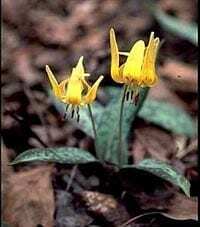 This plant is also known as the Fawn Lily, American Trout-lily, Yellow Trout-lily or Yellow Adder’s Tongue. It is also known as the Dogtooth Violet, referring to the tooth-like shape of the white underground bulb. The plant was reportedly used by native Americans for a variety of medicinal purposes. The juice from crushed leaves was used by Cherokees for wounds that would not heal. An infusion of the root was also given for fever.